Heel spurs are bony, hooklike protrusions on the back of the heel. 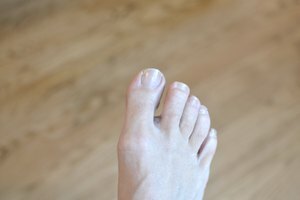 They can be the result of injury to the band of connective tissue that runs across the back of the heel. The injury provides space for calcium deposits that build up and create the spurs. Heel spurs can be painful and bothersome, especially when wearing shoes. The most common remedy for heel spurs is surgery, which can be painful and have a long recovery time. Fortunately, there are other remedies for heel spurs that can be done at home. Use apple cider vinegar to dissolve your heel spurs. The vinegar will get rid of the spurs in several weeks. There are many ways to apply the vinegar; the most important part of using this remedy is keeping the application medium moist. Wear a wrap on your heel soaked in apple cider vinegar for as much of the day as possible. There are several ways to do this. Cut apart a paper bag and fold it over so you have a double-thick layer of paper. Soak the paper as heavily as you can in apple cider vinegar and press the paper into the heel of an old shoe. Put the shoe on and go about your business. Soak the paper again every couple of hours. Try to get to it before it becomes completely dry. Constant application should clear the heel spur in about a week. If you can treat your heel spur only at a certain time of day, soak a cotton towel in apple cider vinegar, fold it into a square and tape or secure it to your heel with a cloth bandage. You also can tape gauze to your heel, or soak the cloth bandage in vinegar. Just make sure you keep the application constantly damp with vinegar. You can wear all of these applications around the house while doing chores or going about your evening routine. Soak the spur until you go to bed each night; it should clear up in two or three weeks. Treat yourself to a “spa” treatment with apple cider vinegar, especially if you have spurs on both heels. Gently warm apple cider vinegar in a pan and pour it into a small plastic tub. Soak your feet in the tub, adding more warm vinegar as it cools. This negates the need to dampen cloths and also may soften hard calluses and eliminate foot fungi.